Several years ago, Julia was searching for an effective story to teach children about the differences between tattling and telling. When she couldn’t find the right resource, she decided to write her own book—A Bad Case of Tattle Tongue. Fastforward nine years, and she has published 76 books from the National Center for Youth Issues, Boys Town Press and the CDC. Cook’s ultimate goal: make a positive difference in the lives of people both young and old by teaching lifelong problem-solving skills. This modern day Dr. Seuss (actual comparisons) has been endorsed by the National Center for Missing and Exploited Children, Safe and Sound (A Sandy Hook initiative,) Childwatch of North America, the Center for Disease Control (CDC,) Childhelp, Darkness to Light, USA Volleyball, The Alaska Department of Education…and the list goes on. Cook’s research-based books have been referenced in such publications as Parent’s Magazine, The New Yorker, The Chicago Tribune, Care.com, Military Spouse, Yahoo.com, Dr.laura.com, and babyzone.com. She has also been featured on CNN’s HLN News, and numerous metropolitan networks including Atlanta and Chicago. She is the recipient of many book awards including The Association of Educational Publisher’s Distinguished Achievement Award, the National Parenting Seal of Approval, and The Mom’s Choice Award. Julia frequently delivers entertaining and engaging keynote addresses at national and international education, counseling, business enhancement, and character conferences. She has presented in over 1000 schools nation-wide, and has been featured in major markets such as Chicago, Orlando, St. Louis, and Atlanta. 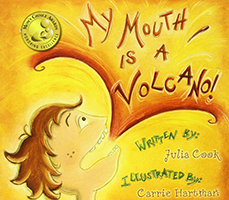 Julia now speaks at conferences with authors like Mem Fox and Eric Carle. This former teacher and school counselor chose to “think outside the box” and has now become a rising literary star; teaching thousands of people, and helping them learn effective problem-solving skills that will last a lifetime!